Kids who love fishing will have a great time learning and practicing their skills in Bandon. Several lakes in the area are stocked to give anglers of all ages the opportunity to catch legal-sized trout. 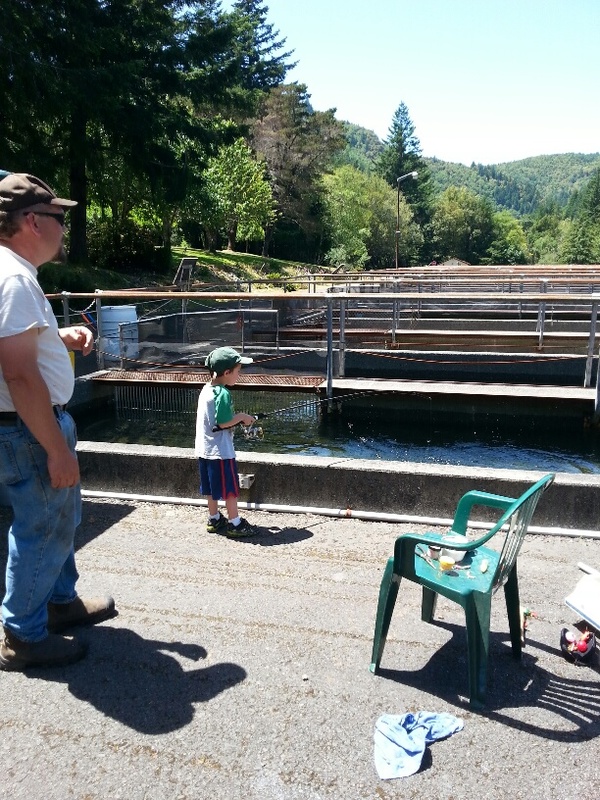 Each spring, the Oregon Department of Fish and Wildlife sponsors a Free Fishing Weekend for children at either the Elk River Hatchery, located about 7 miles out the Elk River, a total of about 31 miles from Bandon, or Arizona Pond, about 39 miles south of Port Orford. The hatchery staff and volunteers teach children about fishing and assist them in getting set up to try it out themselves. A rearing pond is stocked with trout, some of which have been fed all summer by visitors and have become enormous, and the children are allowed to fish until they have caught their limit of three. Some are lucky and leave with those enormous specimens, and some win prizes of a kid-sized tackle box. Free Fishing Weekend for Kids is held the first weekend in June. For more details, call the Elk River Hatchery at (541) 332-7025. My family and I drove to the south coast for a vacation this past summer to visit some friends who had moved there. 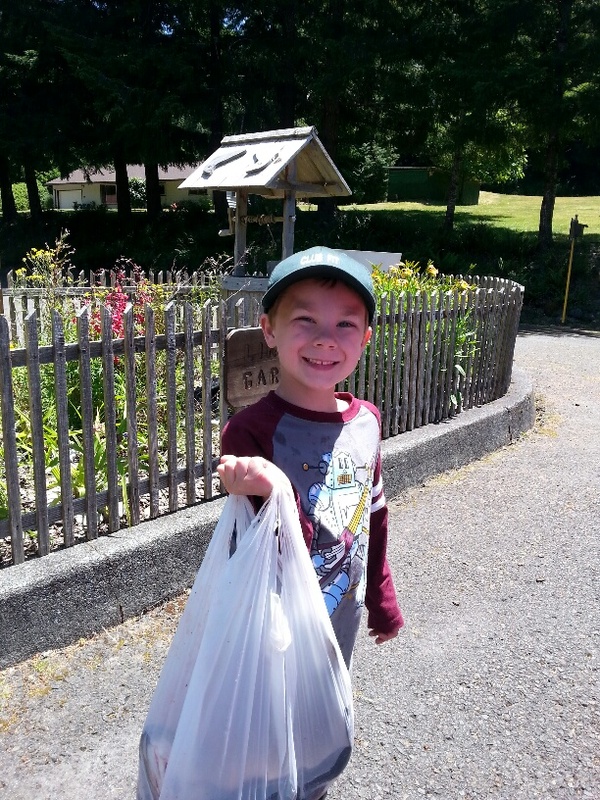 Before leaving home I noticed a fish and wildlife email regarding free fishing days for children across the state in June, and I noticed they had an event near Port Orford at the Elk Creek Hatchery, we decided to visit while we were nearby in Bandon. It was a beautiful drive following the river to the hatchery. We pulled up to the hatchery and scheduled a “fishing appointment” for our boys, ages 4 and 6. Coming from Portland, I expected a pond stocked with 8’’ trout and hoped that the boys might catch a few if they were lucky. The boys were quite intrigued to find out that they would fish out of a hatchery pond full of trout that I would estimate run between 8’’ and well over 2’. Each child was allowed to catch and keep 3 fish with the assistance of the Oregon Department of Fish and Wildlife staff. The big ones pulled line out from the fishing reel, raced up and down the pond, and made enormous splashes to the excitement of the fisher person and the small crowd observing! They were netted by ODFW staff, and it took a couple attempts to net one of the really large fish. My boys each caught a giant rainbow trout and a couple smaller ones, which was quite exciting for them. Additionally, my younger son was given his first tackle box. Afterward the boys played in the Elk River on a nice sunny Oregon summer day. We later enjoyed fresh rainbow trout that were so large they had to be baked and shared with neighbors. This was a great experience, and I would highly recommend the Elk Creek Hatchery Youth Fishing Day! Lunker Lake, under two miles from town, offers year-round fishing with no license required. The private six acre lake allows only fishing activities, and anglers can keep everything they catch. The fee depends on the size of fish caught. Poles, tackle, and bait are available for those who need it. Lunker Lake is open during daylight hours, but call ahead to let them know you’re coming. Call for more information. To see the area’s stocking locations and schedule, visit the Oregon Department of Fish and Wildlife website at http://www.dfw.state.or.us/resources/fishing/trout_stocking_schedules/2014/South_Coast_District.pdf.